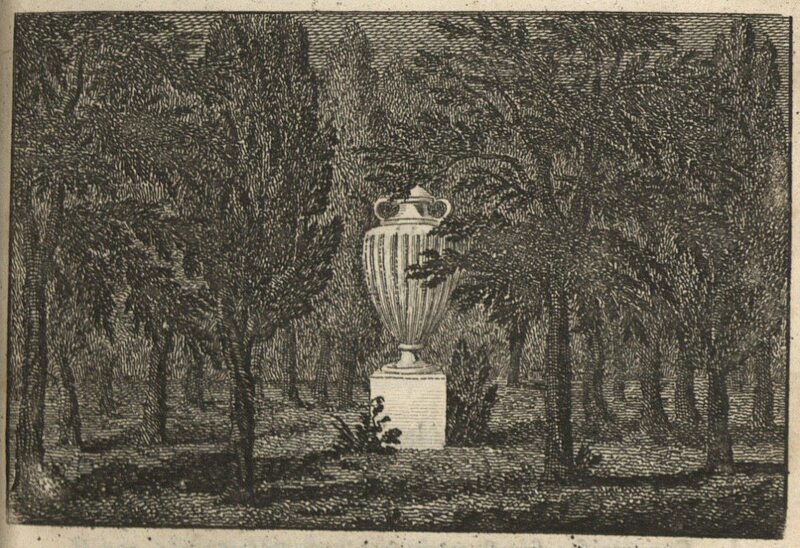 Image: Engraving of a classical urn set amongst trees accompanying ‘Elegies, written on many different Occasions’ by William Shenstone in The Works in Verse and Prose of William Shenstone, Esq., Vol. I, Second Edition (London, J Dodsley, 1765) p 11. A ‘visto’ or ‘vista’ was a narrow, distant view (while a ‘prospect’ was a wide, extensive view). Attention to such minutiae can be seen as part of that most discriminating taste for which Shenstone was admired, and because of which the Leasowes came to be so much visited. 10 Letters written by the late Right Honourable Lady Luxborough to William Shenstone, Esq. (London, J.Dodsley, 1775).